Bikaner also means Bika's fort, this city as its name suggests is a homage to its very creator. Rajathan is a land of mysteries, myths and legends. Passionate beliefs and strong faith. In the rustic town of Deshnoke a temple dedicated to a goddess and to rats is a living example of the strong religious fervour that permeates this desert state. More than 600 years old, the Karni Mata temple, 30 miles south of Bikaner in the small off beat town of Deshnoke is hugely famous and somewhat unique. The resident diety Karni Mata was a mystic who lived in the 15th century, she is also believed to be an incarnation of goddess Durga. The daughter of a 16th century Charan she was married off at the age of 27. Soon her marriage dissolved and she became a sanyasin and devoted her life to the service of the poor. Protected and sheltered by the Rathore clan of Bikaner she predicted great glory for Bika when he set out to establish a kingdom for himself. Karni Mata was an ascetic who dedicated herself to the service and upliftment of the poor and the downtrodden. It is believed that she possessed supernatural powers. She laid the foundation of Deshnoke and her principal followers, Charans, as well as the rulers of Bikaner have worshiped her as a goddess ever since. According to legend Karni Mata once tried to restore a dead child back to life but failed because Yama, the god of death, had already accepted his soul and re-incarnated him in human form. Inflamed Karni refused to accept this and said that Yamaraja would no longer govern her tribe of Charans. At death they would enter the bodies of kabas, or sacred rats, and when the rats died they would be reborn as Charans. So in this temple not only the mother goddess but also well fed rats (called kabas) have made a comfortable home for themselves. The high priests here have gone to great lengths to protect the rats whose bodies are believed to house the souls of Karni Mata's departed devotees. Devotees offer milk, grains and sweets to these rats each time prayers are offered in the temple. Legions of tiny brown rats can be seen scampering around the floor and sighting a white mouse is considered very auspicious. It is believed that the Maharaja of Bikaner had a vision in which the goddess asked him to protect the rats and for this reason, there is bronze wire mesh across the temple. The temple is built according to the Mughal style of architecture and was constructed by Maharaja Ganga Singh in the early 20th century. The entrance, is lavishly decorated with beautifully sculptured marble paneling full of intricate patterns, and delicately worked doorways, colonnades, pavilions and balconies adorn the temple. The Sanctum sanctorum of the temple depicts Karni Mata as Durga after slaying the buffalo-demon Mahishasura. Her inverted trident is impaled in the demon's head. The domes of the temple are made of silver and gold. The manadap and the panels above the image are golden also. Devotees usually place offerings of silver and gold when their prayers are answered. The traditions here will take you back centuries, in a time we can only ever imagine and the beauty of it is that for the residents and the devotees, it is not just a temple or a legend, for them it is a truth. The Karni Mata Fair held twice a year at Deshnoke sees devotees throng to the little town and worship her as the incarnation of goddess Durga. The festival is held in the months of Vaishakha (April/ May) and Kartika (October/ November). Following another old tradition the Rajputs who inhabit this land always bring their children on jadula (the day of the child's first haircut) and place them at the deity's feet for blessing. This temple is situated in Deshnoke a small town near Nokha in the Bikaner district of Rajasthan. Bikaner is well connected by both rail as well as good motorable roads to all parts of Rajasthan. The nearest Airport is in Jodhpur, 245 km away. 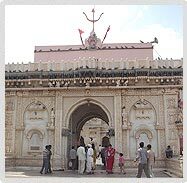 During the Karni Mata Fair in Chaitra, (March- April) special buses and trains carry the pilgrims to Deshnoke.